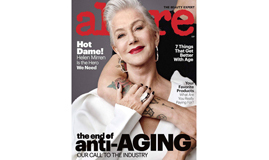 The September issue of Allure magazine featured a cover story on why we should stop using the term anti-aging. I learned about it from the New Old Age conference put on by The Atlantic earlier this year. The point is that anything we put after “anti” suggests something we want to kill or see as bad. Putting it in front of the word aging runs counter to our natural striving to stay alive. The writers at Allure have committed to banning the word from their pages. Of course, advertisers may not jump on the wagon just yet, but it’s a step in the right direction. The more we shine a light on the absurdity and discriminatory nature of the term anti-aging, the more we open ourselves up to be free to live as ourselves. Check out this video put out by Allure and see what you think.